Black Squirrel, Palm Warbler and Mourning Cloak. Proof of Reduction Woodcut by Ken Jansuki. Female American Kestrel with Dead American Robin. Proof of Linocut by Ken Januski. It's almost unheard of for me to have two prints in progress that I'm happy with at the same time. It's hard enough to just get one. Of course just voicing this thought will probably jinx one or both of them. 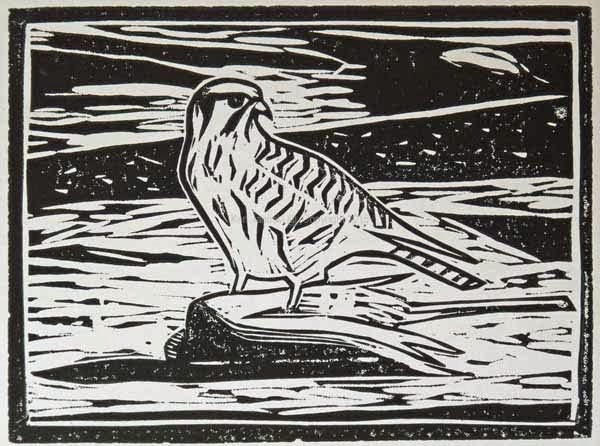 I've been working mainly on the kestrel print since the ink is taking so long to dry on the squirrel reduction woodcut. But I had some left over ink from proofing the newest state of the kestrel today and decided to try it on the woodcut, especially as the color is close to the one I plan to use. The color is a bit thin but it gives me a good idea as to how the woodcut might continue to develop. And the linocut looks good as is. I still plan to print two versions of the kestrel, one in just one color and the other with hand-coloring on top of that one color. I've ruined a number of prints by carving too much away and ending up with a print that is just too white. So this one may be ending soon. I just need to let it rest a bit and see if it looks like it holds together as is or needs a bit more tweaking. Still not too many new warblers to distract me from finishing this though today did bring the first Greater Yellowlegs I've ever seen at Morris Arboretum. Did I ever mention that shorebirds are just as distracting as warblers? Osprey with American Robin. 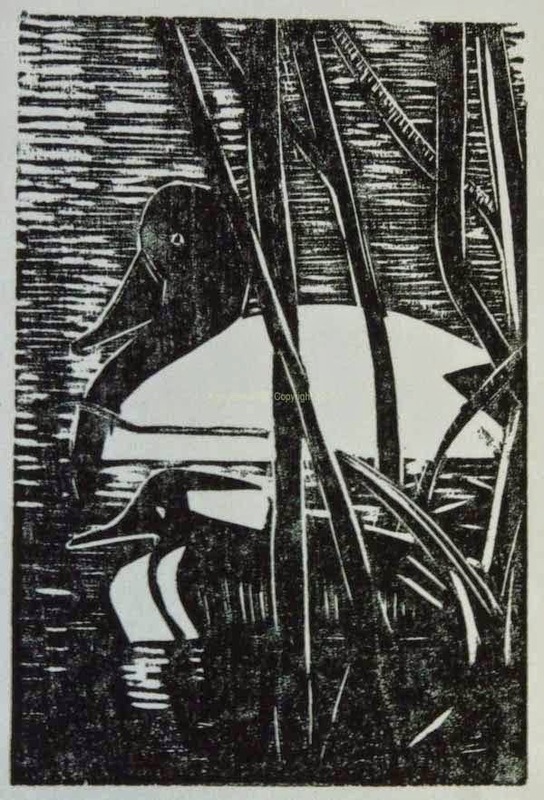 Early Proof of Linocut by Ken Januski. Yes, yes, yes it is the time of newly arrived warblers and other neo-tropical migrants. And though I've been out many hours and walked many miles over the last few days I have seen very few warbler or new migrants. Yesterday we saw our first Eastern Kingbird, Warbling Vireo, and first in Philadelphia Common Yellowthroat at Morris Arboretum. We also heard our first Baltimore Oriole at Andorra Natural Area yesterday and saw our first Yellow Warbler today at the Schuylkill Center for Environmental Education, all locations I'm happy to say that are within 5 miles of our house. So we have seen some new migrants, just not as many as you'd expect for the time of year. The last photo in this post does include a warbler, the brilliantly golden Palm Warbler. But a problem with slowly drying ink forced me to put it on hold yesterday and start something new. 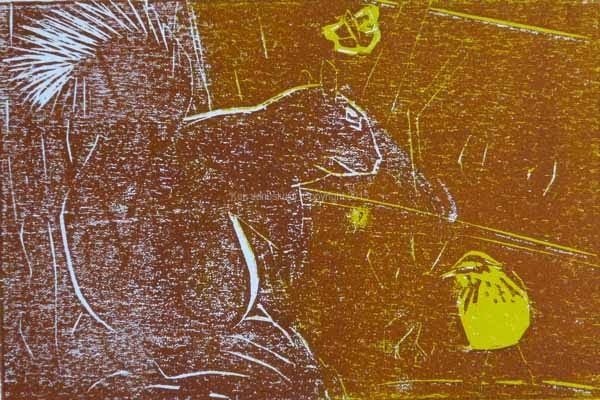 I didn't want it to be particularly complicated so I went with a linocut based on the female American Kestrel eating an American Robin at the parking lot of Morris Arboretum about a month ago. I'll most likely print it in just one color but may hand color at least some of the resulting prints. It is based on a photo I took and then a pencil drawing based on the photo. So far I like it and the fact that it pretty well captures the stance and look of the feeding kestrel. Mature Bald Eagle Along Wissahickon Creek. Photo by Ken Januski. So the kestrel is the start of the 'raptors' in the subject line of this post. A few days ago I also saw my first of the year Osprey in Philadelphia, just down the hill from us along the Manayunk Canal. 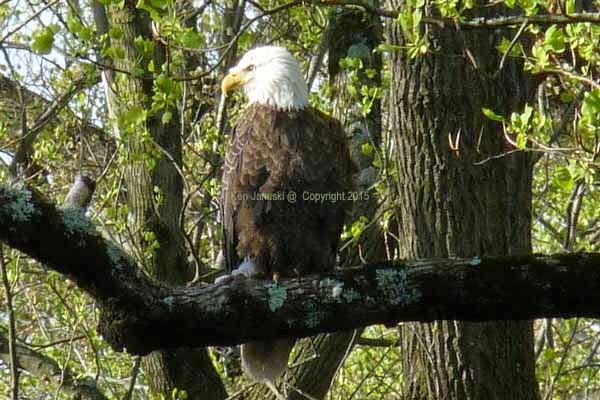 Then today, while looking for warblers along the Wissahickon, I saw this handsome mature Bald Eagle. This is near the place that I saw our last Philadelphia Osprey, on Thanksgiving, 2014. This part of the Wissahickon is also less than a mile from our house, like the Manayunk Canal, and like the nearby church that hosts nesting Peregrines. It remains astonishing to me that all these raptors can be seen, though not by appointment, within a mile of our highly urban home. Black Squirrel, Palm Warbler and Mourning Cloak. 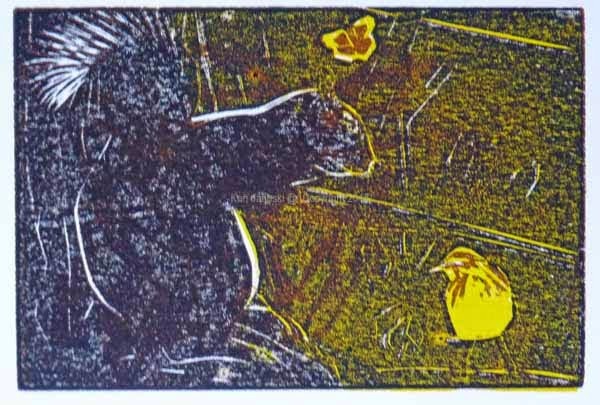 Early Proof of Reduction Woodcut by Ken Januski. When I said that I wanted to do a simple linocut I meant simple in comparison to the complexity of the reduction woodcut above. It is tiny, only 4x6 inches. But the composition is complicated and I'm sure the process as it goes along will be complicated. I showed a pencil sketch and crayon version of this recently, based on something I'd seen one day. What I like so far about this print is that it captures exactly what a Palm Warbler looks like in the drab days of early spring. a golden yellow bird, decorated in rich Burnt Siena. I'm taking artistic liberties by using the same yellow for the light part of the wings of the distant Mourning Cloak. And the Gray Squirrel is in fact a 'Black' Gray Squirrel, one that is almost velvety black. Every time I see one of these squirrels I want to include that rich black in a painting or print. So the challenge here is to combine the black and the yellow and Burnt Siena in some plausible and I hope strong way. 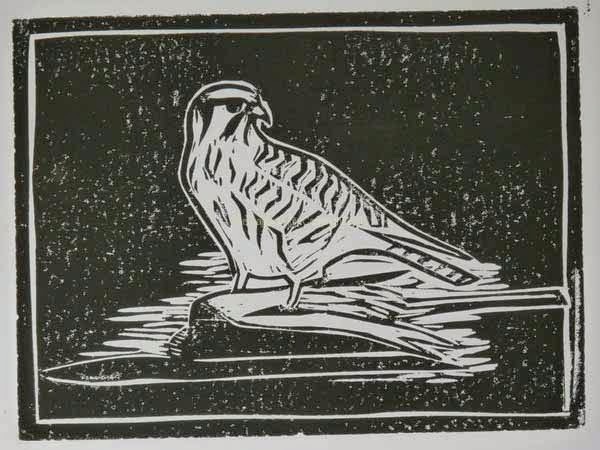 Even though it is a very small print it is thus far more complicated than the larger kestrel print. Time will tell how they both work out. And very soon, perhaps tomorrow, all those neo-tropical migrants will arrive and make it so much more difficult to concentrate on these prints. But who can complain? Almost as soon as I published my last post on including an environment in bird and wildlife art I noticed another method of bringing vitality and a sense of the excitement of nature that I'd forgotten to mention. This is surprising since it is what really convinced me that you could make art out of natural and specifically wildlife subjects. That other method of course is working from life. I first noticed this in Drawing Birds by John Busby. But as soon as I posted the last post I noticed another fine example by a contemporary Spanish artist. I think that there is something that so often comes through in the work of anyone who draws or paints birds or other wildlife from life. That sense of stagnation and boredom that so often accompanies work based solely on photos is completely absent in artists who work from life. As you can see from the sketch above though not everyone is equally able when working from life. 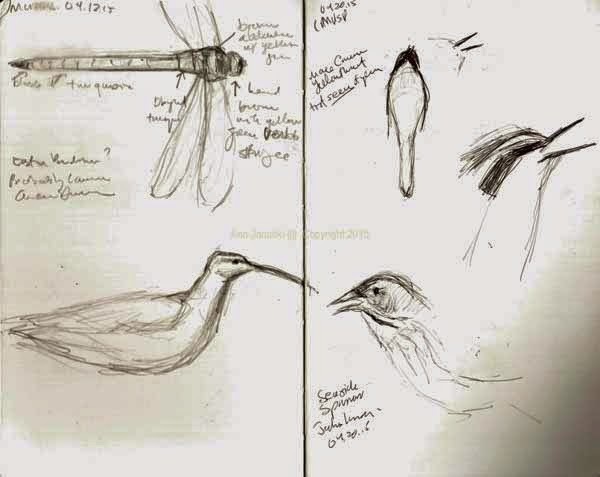 Except for the Common Green Darner at upper left the other birds on these pages were sketched by me over the last couple of days in Cape May, NJ. 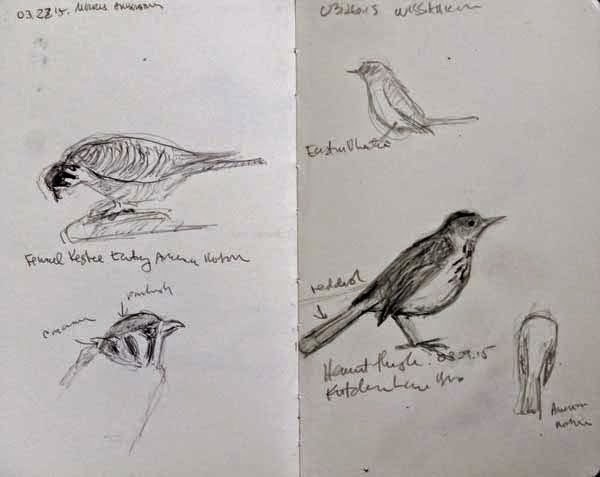 One of the more exciting birds was a Whimbrel at the Wetlands Institute on bottom left, two Seaside Sparrows only one of which I sketched on bottom right and the first visible Common Yellowthroat above. I'd heard them the day before but finally a number came out to sing in their striking black, yellow and white colors. Though I didn't succeed very well I wanted to capture the fabulous yellow throat of the Common Yellowthroat. In any case there are really quite a number of artists who work from life, though I know of very few American artists who do, though there are some. But they are well worth pursuing. And they do often create really strong art that has all the excitement of being outside in nature. 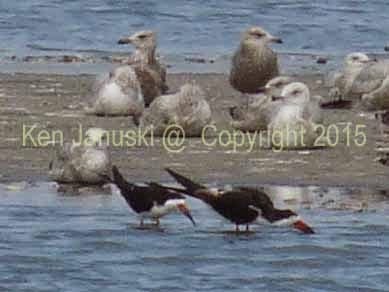 Black Skimmers at Heislerville WMA. Photo by Ken Januski. I always enter my bird sightings in ebird and today I had problems with some birds seen on our trip. Ebird, with good reason, doesn't expect certain birds to be around yet, based on years of previous data. But birds always surprise you. One species that created problems was the Black Skimmer, two examples of which are seen above, from yesterday at Heislerville WMA in Cumberland County, NJ. Normally I just upload my photos to Picasaweb and create a link that I can embed in my ebird list. Not today. All of my photos are currently missing on Picasaweb. My guess is that this is due to Google trying to force people to use Google+, their answer to Facebook. I understand their point of view but it's also a slap in the face to their users. So I won't soon be using Google+. In the meantime though I have no way of showing the photos to ebird. That is the main reason I'm showing the photo above. Semi-palmated Sandpipers at Heislerville WMA. Photo by Ken Januski. 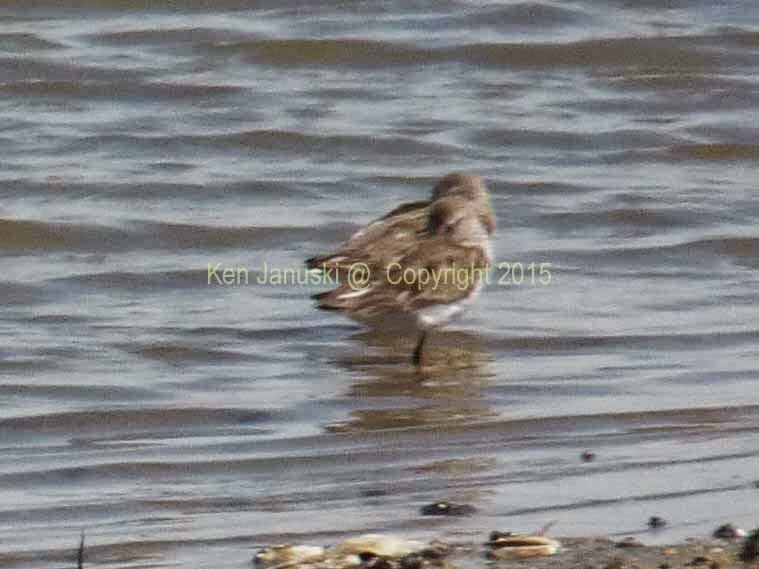 Less well seen and photographed at the same location yesterday were some Semi-palmated Sandpipers. Two are pictured above, also as proof for ebird. Before we left Philadelphia for Cape May I had heard my first Louisiana Waterthrush, singing and singing but never making himself visible. Though I love to finally know that they are here it's always an exciting day when we see our first one. Today at Morris Arboretum Jerene had the honors of finding the first one. More than that he was very cooperative and seemed oblivious to us. So along with photos I also took a quick video with my camera and put it on YouTube: Louisiana Waterthrush at Morris Arboretum. I always greatly enjoy seeing them. And I think you can see from this video why it is difficult to sketch them, at least when they are moving as quickly as this. Bloodroot in the Wild, Etc. 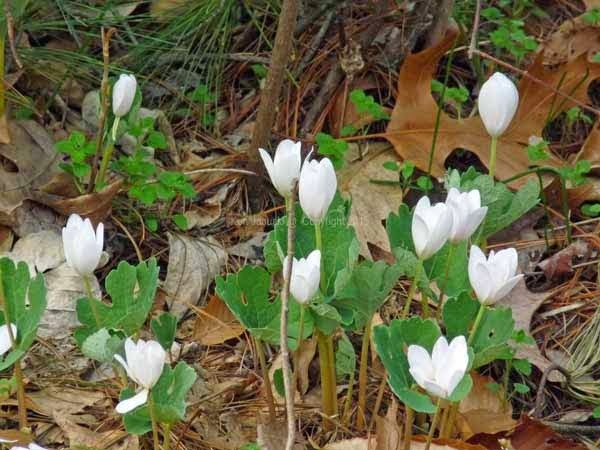 So you might ask, where else would you find Bloodroot if not in the wild? After all they are a wild flower. The odd thing is that we used to see so many of them while at Shenandoah National Park and elsewhere that we wanted to get some for our own small yard. So over the years we've bought such wildflowers from local arboretums and nature centers. Most of my previous photos of Bloodroot on this blog have been of our yard wildflowers. It seems like quite a while since I've shown wildflowers in the wild. Today though I happened upon this small group, just about ready to fully open so I took a photo. I'd like to have seen the Louisiana Waterthrush that was singing today and possibly would have included a photo of him. But it was not to be. Even on leafless trees I could not find him, though he sang for at least 15 minutes. Soon enough though. In our yard Black Cohosh, Blue Cohosh, Trillium Luteum and most likely Goldenseal are all up as of this week. Soon wildflowers will be all over and just as soon they'll be gone. Common Green Darners, Tree Swallow, Pied-billed Grebe and Canada Goose on Nest. Watercolor by Ken Januski. Speaking of wild above is a new watercolor on the same theme as the last post: spring flight with Common Green Darners and one Tree Swallow. I'm happier with this than with the first pencil and crayon sketch. It would be easy to complain about the lack of detail in this. 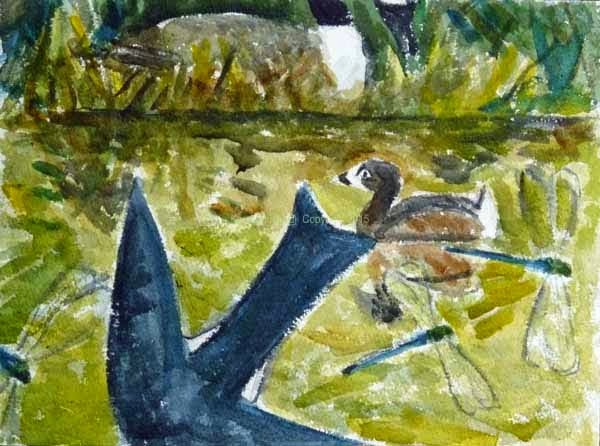 In wildlife art detail still seems to rule the roost. Comments like "I love your detail" are common. But I have no interest. When I first started with bird art, almost nine years ago I immediately saw one of the biggest problems: what world do you put the birds in? Do you avoid the problem completely by just doing a vignette, where the bird is the focus and the background just fades away to nothingness. Do you crop it drastically, somewhat as I've done with the Tree Swallow above, and hope that viewers will be happy with just a partial view of the bird, or any other wildlife subject? This seems to be the most common method, but it's also a glaringly obvious method. Some artists do try to include the background, or really the environment, foreground, background and everything in between. They try to put the bird in a world. And if they've actually experienced birds in the world, rather than just copying them from photos, then the paintings/drawings/prints tend to work. The real problem is that it is so easy to care too much about the environment, to feel that every little leaf must be portrayed. But no one sees or experiences the world that way. The world moves too quickly. If you're focusing on some leaves then your eye can't possibly be also focusing on feathers of a bird or fur of an animal. That's not the way the eye works, at least not in real life. How do you capture the environment and still have something that has even the slightest hint of wildness. When I do a painting like the one above I willingly give up a lot of detail. I'd rather get details wrong but get the whole scene right. Every time I do a painting like the one above I soon realize that something is wrong, some detail, if not something larger, is off. But I really don't care. It has taken me a long time to realize that this is my voice in art and wildlife art: to somehow or other portray the whole scene, sometimes more abstractly than others, but still to try to capture the actual experience of being outside and seeing birds in their world. As a consequence I do my best to value spontaneity and the overall scene over actual detail. A few rare artists I think manage to do both, but only those who see the value of portraying the entire world and have the experience of being out in it and who also have mastered the structure of birds. For them the spontaneity is there but the shorthand they use is so sure I think that no one even notices that the details might not be there, or even more miraculously they also are able to include the telling details while still remaining spontaneous. I won't name any names but that is wildlife art at its best. No I don't care a whit for detail in wildlife art. Please show me wildlife art that is wild, rather than the tamest thing in the world. Common Green Darners, Tree Swallow, Pied-billed Grebe and Canada Goose on Nest. Pencil and Crayon Sketch by Ken Januski. One of the great thrills of spring is the exuberant flight, or at least it looks exuberant to me, of birds and insects. Tree Swallows are always among the most impressive and such a welcome change from the slow pace of winter. Yesterday they were joined by the first dragonflies of the year, Common Green Darners, as well as soaring Red-tailed Hawks. I couldn't find a place for the hawks here but I did manage to combine the Tree Swallows and Common Green Darner. Typical of this time as well, particularly in the wetlands of Morris Arboretum, are nesting Canada Geese. Much rarer and in fact yesterday was the first time we've seen them there were Pied-billed Grebes, in migration I'm sure. I think because this is such an exciting time I'd like to use a medium that matches the excitement and exuberance. Over the years I've found that pencil and water soluble crayons, which are capable of also being used as a wash, work very well. 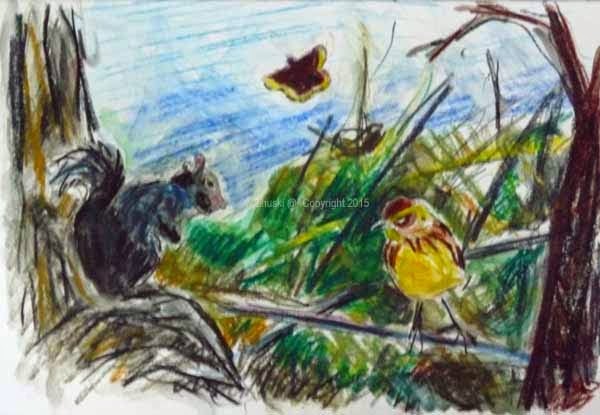 As in the last post this is done with Caran d'Ache Neocolor II crayons..
'Black' Squirrel, Palm Warbler and Mourning Cloak. Pencil, Wash and Caran d'Ache Neocolor II Crayon Sketch by Ken Januski. I have to say that I think one warbler exemplifies the arrival of neo-tropical migrants more than any other: that is the Palm Warbler, especially the Eastern race which we tend to get here. The golden yellow, with warm Sienna cap and markings, is indicative of spring and warm weather. Other warblers are generally first. We may see a Pine Warbler or two, maybe a Louisiana Waterthrush and at least this year Yellow-rumped Warblers, which when they aren't sky high in the trees are actually pretty colorful themselves. Still it is the Palm that signals winter turning to spring and eventually summer. Yesterday I saw my first Palms of the year, the first sky high where the Yellow-rumpeds should be, but still obvious from their constantly bobbing tail. The next one I saw was down closer to the ground but still not below eye level as they so often are. When that's the case you can't miss their golden yellow coloring. Yesterday also brought out the second Mourning Cloak of 2015, the first one having been seen the day before, as well as a 'Black' Squirrel. Black Squirrels are really Gray Squirrels but with a darker color. But they seem exotic. And if you're an artist you can't help but be struck by their rich black coloring. When I got home yesterday I tried a quick ballpoint pen and watercolor sketch of the Mourning Cloak and Palm Warbler. But it just didn't work out. This morning I tried again, this time determined to make the Black Squirrel play a larger part. This is on a page from a Stillman and Birn Zeta sketchbook. It is an extra heavy paper and one that I've used before with Caran d'Ache Neocolor II water soluble crayons. I don't use these crayons often but I do find that they are good when I want a particularly vibrant color. And that's just what I wanted for the Palm Warbler. Palm Warbler Amidst Bloodroot. 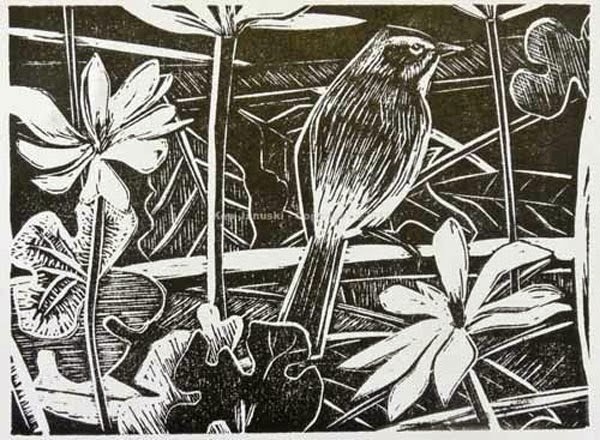 Linocut by Ken Januski. Because Palms are such early arrivals they are often in the woodland ephemerals that are here for such a short time in spring. I particularly see them in Mayapples but I have also seen them in the far more striking Bloodroot. The linocut above, from a number of years ago, places them amidst bloodroot, something that I'd just seen at the Schuylkill Center for Environmental Education. My recollection is that I've seen Mourning Cloaks much earlier in the year on occasion. This year we saw our first on April 6th. That seemed late. But when I checked one of my guidebooks where I often note the first sighting for a particular year I found that April 6th is normal, if not a day or two early. The same thing goes with Palm Warblers. Though we have seen them occasionally in March last year we saw them just one day earlier than this year. So even though this has seemed like a cold and long one, and though it seems everything is late it turns out not to be quite as late as I'd thought. Someone remarked on my Facebook page that the Mourning Cloak is one of their favorite butterfies. It's easy to see why. It also signals the arrival of spring, though the lazy way that it drifts through space makes it seem altogether languid as though it should really appear in the hazy, lazy days of summer. 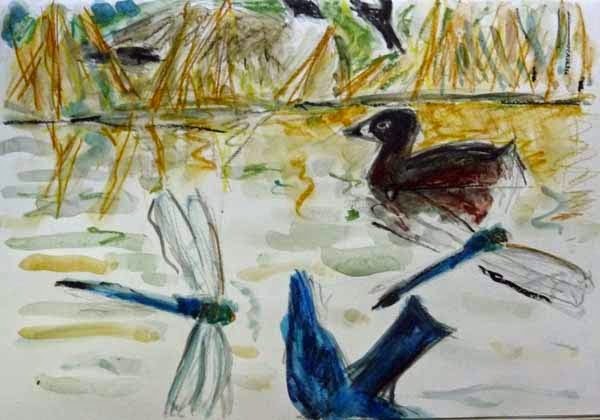 As I look at the pencil and crayon sketch at top, especially compared to the Mergansers and Grebes woodcut that I'm currently using as a header on this blog I realize that there is quite a difference in composition. The woodcut is much more solid in composition, as though more thought went into it. It did. But it also seems a bit rigid. That is fine if that's what you want to express. I have nothing against rigidity. But I don't want it to be my default style, especially when working abstractly where it tends to come quite easily to me. So as disorganized and floppy as drawings like the crayon one of squirrel, butterfly and Palm Warbler might be I do continue with them. My hope is that they will lead to something as organized as the Mergansers and Grebes but with the rigidity well hidden. I think I've been most successful in that goal in the watercolor below of a few years ago. Saddlebags, Savannah Sparrow and Pumpkin at Rea Farm. Watercolor by Ken Januski. Drake Canvasback and Hooded Merganser. Woodcut by Ken Januski. Blame it on something I read about April Fools Day. I wouldn't normally use such a jokey title as I have today. But it is appropriate. We saw our first Brown-headed Cowbirds today, shortly after the first Eastern Phoebes have arrived, and you can bet that some poor phoebes will soon be raising cowbirds, even if the young cowbirds are twice their size. Below are some recent field sketches: I've already mentioned the female American Kestrel feeding on an American Robin at Morris Arboretum. On the opposite page are some of the first Eastern Phoebes and Hermit Thrushes that we've seen this year. At bottom right another thrush, the American Robin, that posed just long enough outside my studio window to sketch in everything but his head. When I looked up to do that he was gone. One of the things I always notice about Hermit Thrushes is that they are pot-bellied. Because of this I sometimes think that all my Hermit Thrush look the same, almost always starting with the pot belly. Still it is accurate. That's just the way they are. They're also a bit smaller than American Robins and 2 out of the 3 times we've seen them together over the last week the Robin chased the Hermit Thrush out of his feeding area. Given his size I guess the Hermit Thrush wasn't going to argue. American Kestrel with Prey, Eastern Phoebe, Hermit Thrush, American Robin. Field Sketches by Ken Januski. Yesterday I experienced something new: printing two editions of the same print in the same day. This wasn't planned. It's just that the first edition of the Canvasback and Hooded Merganser at top was much too dark, with many of the finer lines covered/blurred by ink and/or the type of paper I used. I also switched from a soft to hard brayer part way through the edition with little improvement. After all the work that goes into a print it's very unsatisfying to have the end result be something other than what you anticipated. So after some errands I returned home and printed a somewhat smaller edition. This time I used the smooth side of some Shin Torinoko paper as well as a hard brayer. That seemed to keep the ink just about perfect on the surface of the print. That is what I'm showing at top. This edition is for sale on Etsy. I may eventually put some of the rougher first edition up for sale at at a lower price. It looks alright but it just isn't what I planned on. I've read recently something I read every year or two in a different source. Audiences, to a large extent, like their art to be interactive. By this I don't mean the silly online interactive quality that many struggling businesses use to try to save their businesses. What I, and the people I'm reading, mean is that the artwork is not so perfect, so closed off that the viewer or reader is left cold, as though he's an observer rather than a participant. In other words he is able to use his imagination and experience to finish the work. The most obvious case for this is novels. They are not visual, nor aural. And yet most readers react badly when they see the characters they're familiar with from novels portrayed in film or on television. We often react badly because we've developed through our imagination a far different view of the character. In visual art I think that this is why I shy, to put it mildly, away from high finish in my work. High finish may impress those who assume it must take work to get such a finish, but for an audience that looks for something more I think they often react badly because the art work is closed to them. Their imagination cannot enter into a dialog with the work and complete it as they see fit because there is no room. The artwork is a closed door. Stand back and admire my skill, or else. This is a lengthy argument and something I won't purse at length. But it is not something new, not some fad forced on art by modernism. If you think so then take a look at Rembrandt. Up close so many of his works just show brushstrokes. But from a distance the viewer uses his imagination to complete the work, and history shows that they are far more esteemed than contemporary work of a high finish. Why do I bring all of this up now? It's something I think about in regard to the woodcut. Woodcuts, just like linocuts, can be exceedingly linear and graphic. It would have been possible to outline every branch and twig in the print. I could have made neater more regular lines for the water. Relief printing lends itself I think to linearity. But even though we undoubtedly see line in the world it's not all we see. And if everything is line it undoubtedly can have a strong graphic, two-dimensional effect but it eliminates the possibility of three dimensions, the world in which we actually live. All of which goes to say that I try to avoid too much regularity in my prints. I could easily add them and get a snappier two-dimensional, flat result. But that's not what I want. I think that the more irregular method used above and in many of my prints gives the viewer a little more room to enter the picture and enjoy it. Sorry for this lengthy digression but I often write about my dislike for too much finish in art, especially wildlife art, and I just realized another reason why: it closes off the viewer from the experience. 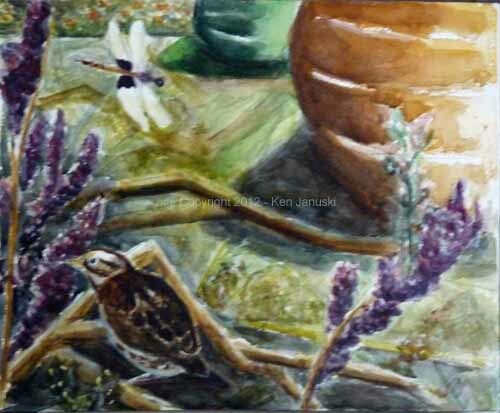 Ken is an artist and birder living in Philadelphia, PA. He exhibited in 'The Natural Eye', the Society of Wildlife Artists Annual Show in London, UK in 2018, 2016, 2015, 2012 and 2011. He was also a finalist for BBC Wildlife Artist of the Year in the International Artist category in 2011 and 2012. All his art work is based on birds or other wildlife that he has personally seen and often sketched in the field.